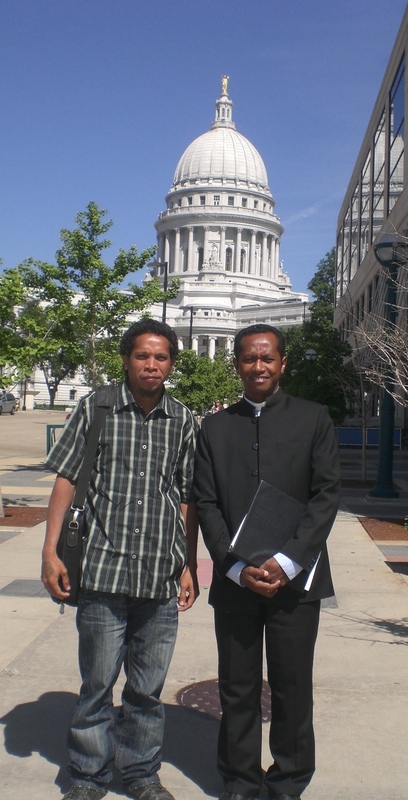 The Madison-Ainaro Sister City Alliance recently welcomed two friends from Ainaro, East Timor, who spent two weeks in our fair town (and nearby communities). This delegation has deepened the bond between Madison and Ainaro, and will allow us to continue our work in both directions. We hope you'll enjoy the following interview in two parts. As always, we welcome your questions and comments at madison@etan.org. Father Evaristo Fernandes da Costa Soares and Hermenegildo ("Agio") Magno Gomes are highly respected community leaders from Ainaro. In addition to his work as a Catholic priest, Father Soares has a strong commitment to youth empowerment and education. He works with the local high school and is helping to organize a new training center for Ainaro primary school students. Agio Gomes is a human rights and sustainable agriculture activist. He's a trainer with PERMATIL, a Timorese organization devoted to permaculture and sustainable agriculture, and is starting to work with the Gardeners of Eden seed project, an agricultural and community empowerment project supported by several Madison groups, including Just Coffee, Family Farm Defenders and ETAN/Madison / the Madison-Ainaro Sister-City Alliance.